Thomas Graham was a Scottish chemist best known for his leading work in the diffusion and dialysis of gases. Graham was born on December 21st, 1805 in Glasgow, Scotland. He was the son of a prosperous manufacturer who wanted him to become a church minister. At the age of 14, Graham entered University of Glasgow. While in the university, he was strongly influenced by the chemistry lectures of Thomas Thomson. After getting his M.A . in 1826, he worked for 2 years with Thomas Hope at the University of Edinburgh. After this, he went back to Glasgow where he taught mathematics and chemistry for one year. In 1829, Graham became an assistant at a school where he taught science. Later, in 1830, he was appointed professor of chemistry at Anderson’s College in Glasgow. In 1834, he became a fellow of the Royal Society. After three years he moved to London, where he became professor of chemistry. In 1841, Graham helped in founding the Chemistry Society of London; this was the first national chemistry society. Graham became the very first president of the Chemical Society of London and by 1844, Graham was generally acknowledged as the leading chemist in England. He remained in this university for 20 years until he was appointed Master of the Mint in 1854. Graham was an organized, logical and a very accurate teacher. When he became Master of the Mint he took the position very seriously, such that he stopped his research work for several years. In 1829, Graham published a paper on the diffusion of gases. Most of the observations on this subject were made by Johann Dobereiner and Joseph Priestley, but Graham formulated the law of diffusion. Graham compared the different rates at which various gases diffuse through some porous pots. He also compared the rate of effusion via a tiny aperture. He concluded that the rate of effusion or diffusion of a gas at a constant temperature is simply inversely proportional to square-root of its density. This is popularly known as the Graham’s Law. In 1860, Graham examined liquids. He noted that colored sugar solution placed at the bottom most part of a glass of water gradually extends its color upward. This process was called diffusion. He also noted substances like gelatin, glue, albumen and starch diffuse slowly. He classified substances into two types: crystalloids, substances that diffuse quickly, and colloids, substances that diffuse slowly. Other works by Thomas Graham includes research into phosphorous acids, absorption of hydrogen by palladium and the water of crystallization in hydrated salts. 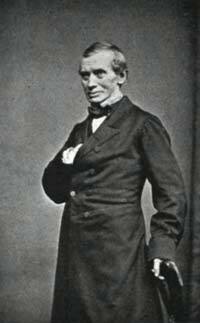 Graham died September 16th, 1869 at the age of 63.